The Database Tour is a powerful data export and data pump tool. New or existing table(s) in the same database. New or existing table(s) in another database of any supported type, e.g. Access, Oracle, SQL Server, PostgreSQL, SQLite, Firebird etc. File(s) of the following types: text, CSV, HTML, Excel (xls, xlsx), dBase (dbf), PDF, SYLK, RTF, XML, Word, SQL script. Image and other separate files from database Blobs and Clobs. There is a large set of export options, which gives you the ability to highly customize the export output and the process itself. 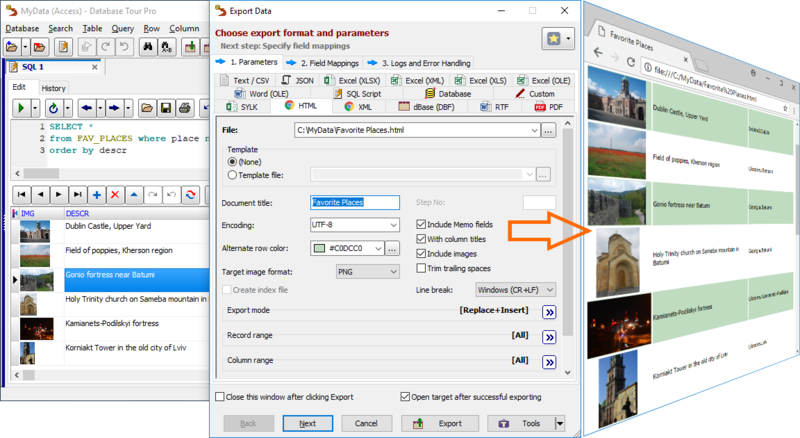 Exporting to HTML, XLSX, PDF, and RTF can be performed with pictures and text formatting (including conditional formatting). 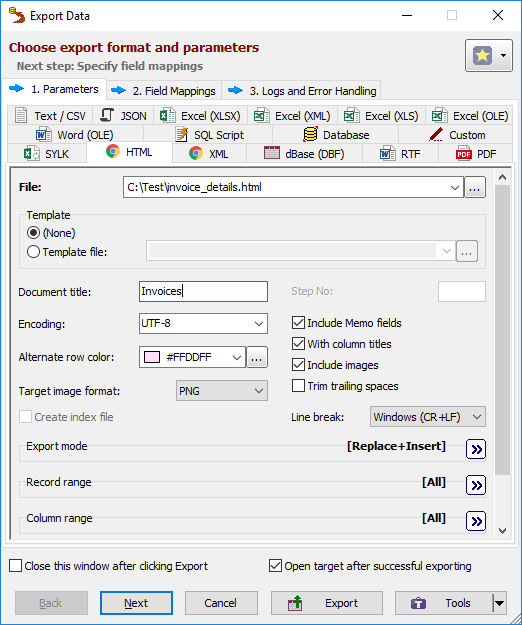 Field or table mappings for export and import operations can be saved to file and loaded from file. In the field mappings, it is possible to specify physical fields or calculated expressions. With calculated fields, you can even define your own output formats or formats not supported directly by this tool, for example, JSON. There is a possibility to export data from the command line (Database Tour Pro only) and to use the feature in .bat files, schedulers, and in calls to Database Tour Pro from other programs, including your own ones. You can import data from a table in the same or another database. Also, it is possible to import data files like .db, .dbf, .csv etc by dragging them into the table list of the open database. Importing works similarly to exporting, where input and output are swapped; therefore, in all cases where importing destination-db from source-db is needed, it can be replaced with exporting source-db to destination-db. Database Tour can also import tabular data from clipboard into an open dataset. In addition to exporting data to many file formats, this export tool allows you to migrate data from one relational database to another. 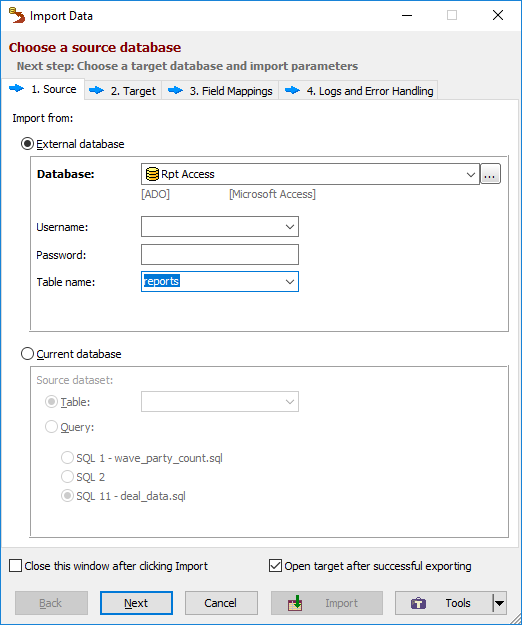 Thus, you can convert Access to SQL Server, Interbase to Oracle, CSV to PostgreSQL, or use almost any other database-to-database export combination. 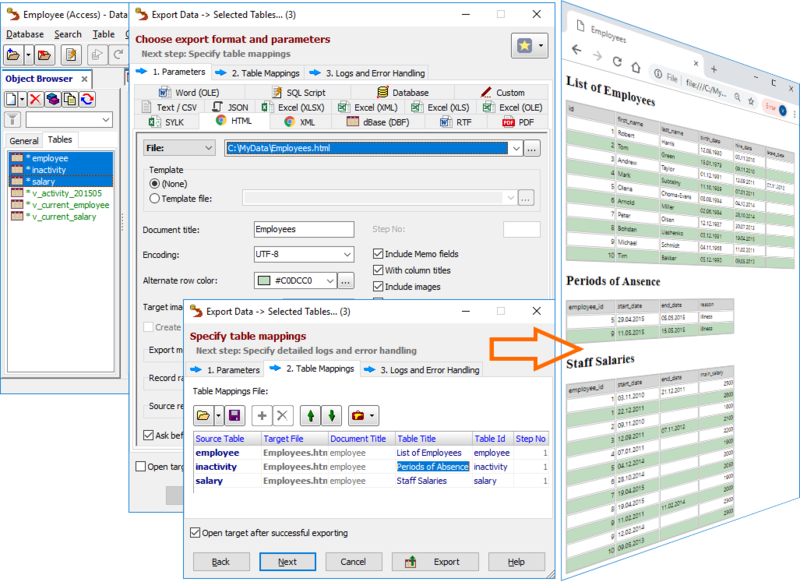 In just a few clicks, you can easily export several selected tables at once. By default, exporting group of tables is done as one source table per one target file or table. 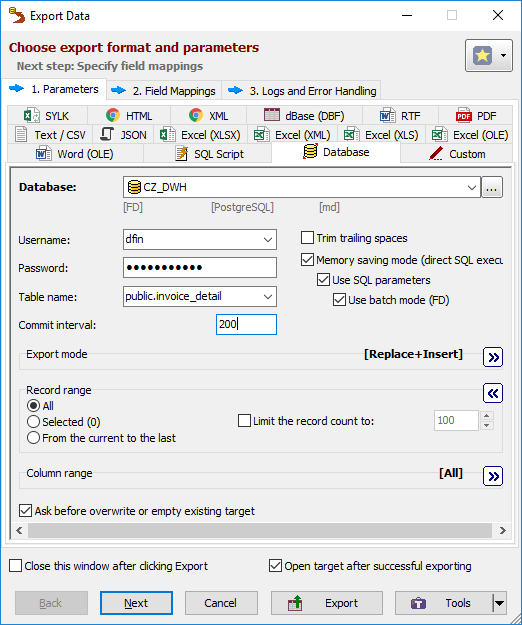 Exporting selected tables to one target file or table is also possible. Before exporting data, it is possible to specify source-to-target field mappings. For most of databases, this export tool is able to convert the source column types to target column types, as you can see in the example of Access to PostgreSQL data migration on the screenshot. Possibility to specify full destination columns' specifications. If the target table already exists, the corresponding warnings are shown for the table and target column names. In the source part of the mappings, you can use either physical fields from the source database or calculated fields (dynamic expressions). The program can automatically detect the most known image types (JPG, PNG, GIF, BMP, ICO) in BLOB fields of a source database and export them, for example, to HTML or XLSX formats. It can also convert image format on the fly. The data from BLOB, CLOB or other fields can be exported into individual files, binary or text. 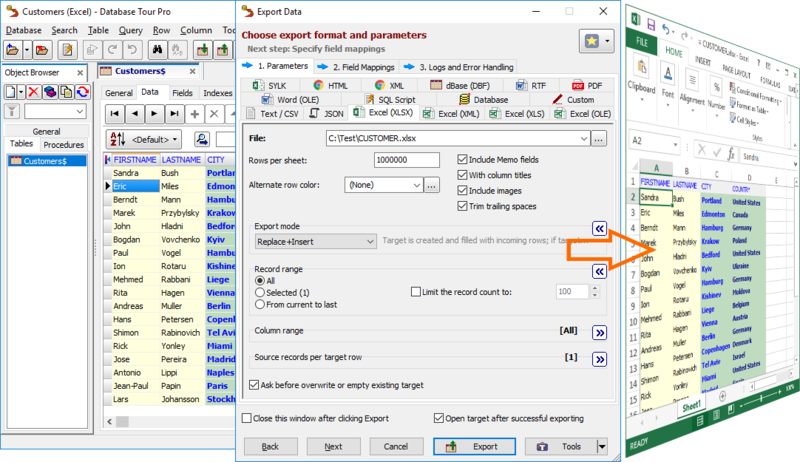 When exporting a current dataset to HTML, Excel (XLSX), PDF, or RTF, it is possible to preserve current formatting (font and background) of the table columns. 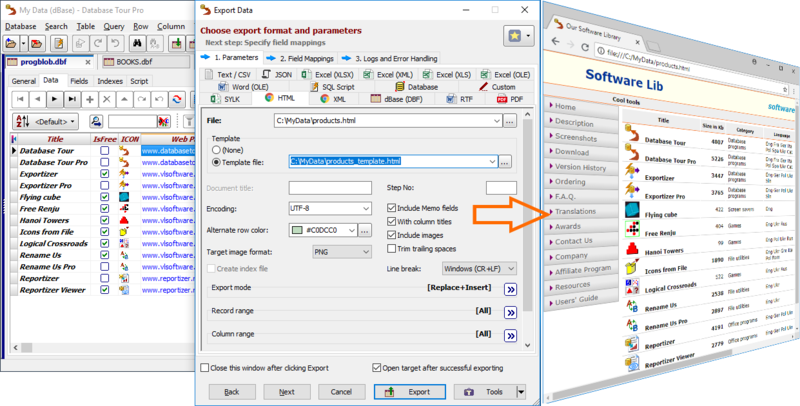 It is possible to choose the output format and specify many common export options as long as options specific to the selected target format. The program allows to import data into the current database from another table (including other database) or open query. There are lot of useful import options. Please also consider trying our dedicated export tool: Exportizer Pro.